Privacy fences restrict viewing into and out of the fenced in area. 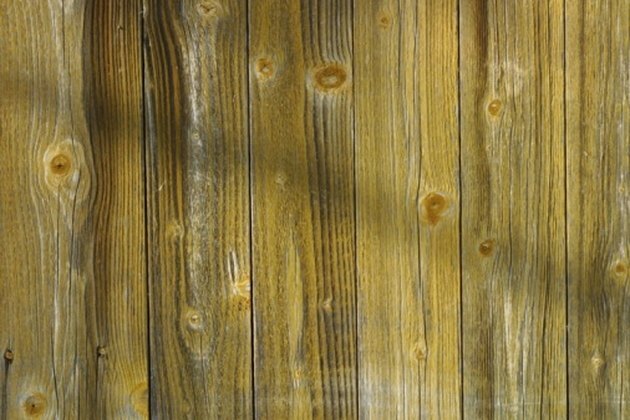 The most common types of fencing materials used for privacy fences are wood and vinyl. The correct way to build a privacy fence on a hill depends on the severity of the slope. For gentle slopes, a privacy fence can be built along the contour. For more severe slopes, a step down construction method must be followed. A simple and effective privacy fence style is the six foot high, two rail, wood fence. A privacy fence can be built on a hill by either following the contour of the slope or stepping down each panel. Research local laws, regulations and codes to determine any restrictions when planning the construction of the fence. Permits may be required. Locate exactly where the fence will be constructed. Measure and record each side of the fence. Draw a schematic map to represent the fence. Include the recorded measurements. Locate where the posts will be installed. Tie a string line between wooden stakes to represent a straight line where the exact position of the fence will be built. Using a tape measure and marking paint, spray a mark every 7-foot, 6-inches. This will be where the holes will be dug. Dig the post holes. Using posthole diggers, dig a hole 18- to 22-inches deep and 4- to 6-inches wide at each mark. Set the posts. Mix each bag of concrete in a wheelbarrow with water from the water hose. Mix the concrete with a masons hoe. Each 4-by-4 post must be set in each post hole before filling the hole with concrete. The 4-by-4 post must be perfectly vertical and barely touch the string line. Pour the concrete in the hole around the 4-by-4 post until the hole is full. Test and correct the post to make sure it is still perfectly vertical and barely touching the string line. Allow the concrete to dry 24 to 48 hours. Mark the posts in preparation for the rails. Measure and mark 3-inches and 66-inches up from the ground on every post.This marks each post for the exact location to fasten each rail. Fasten the rails. Place each 2-by-4 between the posts and hold at the marks. Use a pencil to mark where the 2-by-4 needs to be cut to fit in between these posts. Cut both sides of the 2-by-4 at the markings. Attach the 2-by-4 between the posts using a framing nail gun. Continue until all rails are securely fastened. Fasten the pickets. Using a siding nail gun, nail each picket to the rails snugly together making sure the pickets face in and the rails face out. Follow steps 1 to 6 under the previous section entitled, "Following the Contour of the Slope". Measure and mark each upper post of each panel 3 inches and 66 inches up from the ground. These markings indicate where the rail will be fastened to the upper post of each panel. Mark the lower post for each panel in preparation for the rails. Starting at the upper post for each panel, have an assistant hold a 2-by-4 at the lower mark. Place a four foot level on the 2-by-4 as a guide for positioning the 2-by-4 to be perfectly horizontal. Once the board is perfectly horizontal, place a mark on the lower post of the panel where the 2-by-4 overlaps.This new mark indicates where the 2-by-4 will be fastened to the post. Mark the 2-by-4 where it needs to be cut to fit in between these two posts. Repeat for the upper mark. Cut each 2-by-4 at their markings and attach between the posts at the correct markings using a framing nail gun. Continue until all rails are securely fastened. Fasten the pickets. Using a siding nail gun, nail each picket to the rails snugly together making sure the pickets face in, the rails face out and the pickets horizontally align. Melissa Webb began working professionally creating and writing advertisements in 2006 for the "Lake County Leader" and "Northwest Advertiser." Her work can also be found on eHow. Webb's studies include English, literature and world history.